The Create Survey Extent Polygon tool takes a raw xyz point cloud in a flat ascii file (e.g. *.csv, *.txt,*.xyz, *.pts) and converts it into a polygon shapefile for direct use in deriving a TIN and DEM. The polygon shapefile will be used in constricting the area that is interpolated across when creating a TIN and/or DEM through the Create DEM and/or TIN. It also allows you to specify the spatial reference (coordinate system) of the polygon shapefile. The tool is a precursor to Create DEM and/or TIN tool. File must be space delimited. If it is not space delimited use the TopCat Prep tool to make the file space delimited. defines the window size that will be used to create the survey grid. Every sample window that contains one point within it will be included in the final survey extent polygon. 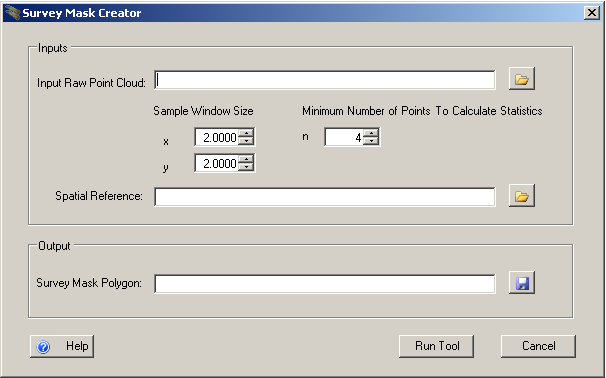 The sample window size should match the grid size that will be used in the subsequent GCD analysis.